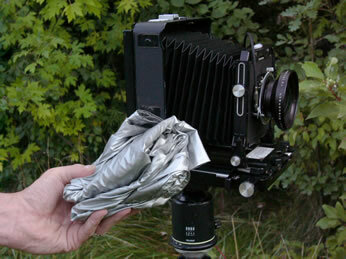 The BLACKJACKET™ focusing cloth is constructed of 100% nylon taffeta with a special "Aluminized" coating. The fabric is lightweight (the ORIGINAL 4x5 BLACKJACKET™ only weighs 8 oz.) and packable, ideal for back-country photo expeditions. Copyright © 2003 QuietWorks Photography. All rights reserved.